Posted June 4, 2014 . 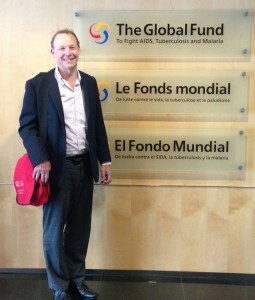 GAFFI visits The Global Fund to discuss funding models for opportunistic infections in AIDS. With the shift in funding model used by the Global Fund for AIDS, TB and Malaria to include a more complete package of care for HIV-infected patients, the major life-threatening fungal infections come high up on the priority list. However estimating the cost of identifying these infections and then treating them differs in each country, in adults and children and by infection. GAFFI’s country by country estimates of fungal disease burden provide an initial source for estimating the numbers of cases. GAFFI has also ascertained the cost of antifungal drugs in most countries. Individual countries can provide the actual medical non-drug costs according to local wages and monitoring costs. With 75 countries applying for The Global Fund’s funding this year, estimating the costs of care over and above antiretroviral therapy and monitoring is a substantial task. GAFFI will work with UNAIDS and The Global Fund to develop equitable and realistic cost estimates, for each country, which can then be negotiated, and subsequently refined in the light of experience.